JP 2007-06-19 600 points ? US 2007-07-23 600 points ? EU 2007-07-27 600 points ? AU 2007-08-10 600 points ? 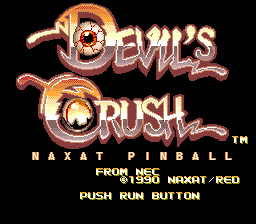 Devil's Crush, known as Devil Crash (デビルクラッシュ) in Japan, is a pinball game developed by Compile for the PC Engine and TurboGrafx-16. The game was censored in North America due of Satanic symbols. Main article: Devil's Crush/Magazine articles. Sega Retro has more information related to Dragon's Fury. This page was last modified on 23 December 2018, at 06:08.